Not too long ago, we dropped into our local Whole Foods grocery store hoping to find a black Arabic tea that we were served while dining at a new Mediterranean restaurant . Although we didn’t find what we were initially looking for, our friendly tea guide and casual connoisseur of ordinary and exotic teas helped us weed through the plethora of brands and flavors until we finally reached a decision. 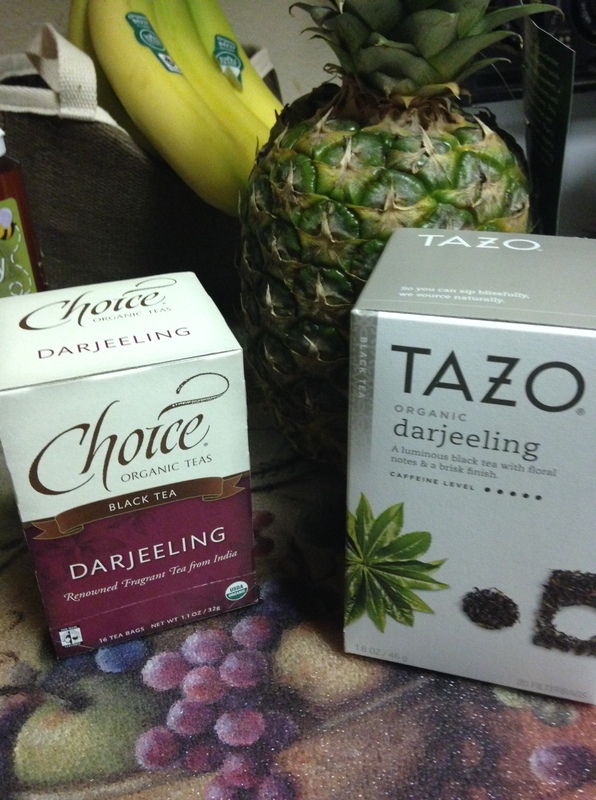 We settled on trying two brands of the same type; a Darjeeling black tea ‘with floral notes and a brisk finish‘ by TAZO. And the other brand was Choice; ‘Renowned Fragrant Tea from India‘. Both advertised as an organic blend of tea. Now, I don’t do all of my grocery shopping at Whole Foods on a regular basis. Trader Joe’s happens to be more conveniently located yet it isn’t that big of a store so it lacks variety. So this evening we needed to stock back up on some produce and meat items and so I decided I wanted to go back to Whole Foods. First stop once inside the store was the produce section. As I was perusing through the various fresh herbs from Basil to fresh mint, a mans voice spoke up behind me as he asked if I enjoyed the tea I recently purchased. Turning around, lo and behold, it was our same friendly tea guide from our previous visit! I was impressed that he actually remembered us and it took me by surprise. After some brief small talk on tea, he mentioned another type that he really enjoyed that I recalled him saying something about it the last time. After a couple of moments of small talk, our conversation ended and I carried on with my shopping. A little bit later while exploring the dairy aisle, the same friendly tea guy reappears and prompts me to follow him down to the tea aisle where he pulled his favorite tea off the shelf. 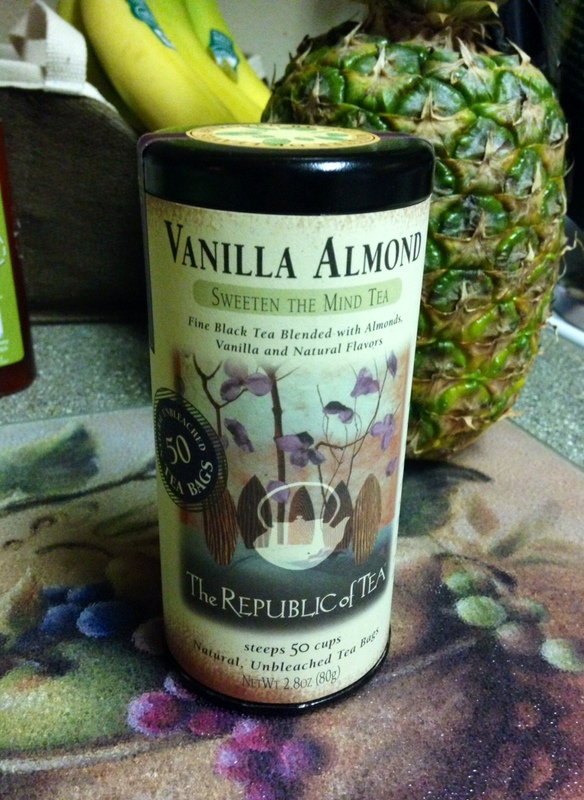 It was a Vanilla Almond black tea from The Republic of Tea. I don’t know about you, but I don’t have these kinds of awesome customer service experiences very often when I go grocery shopping! I was stunned. Floored. I was not getting a DISCOUNT on 50 bags of tea. I was getting it for FREE! 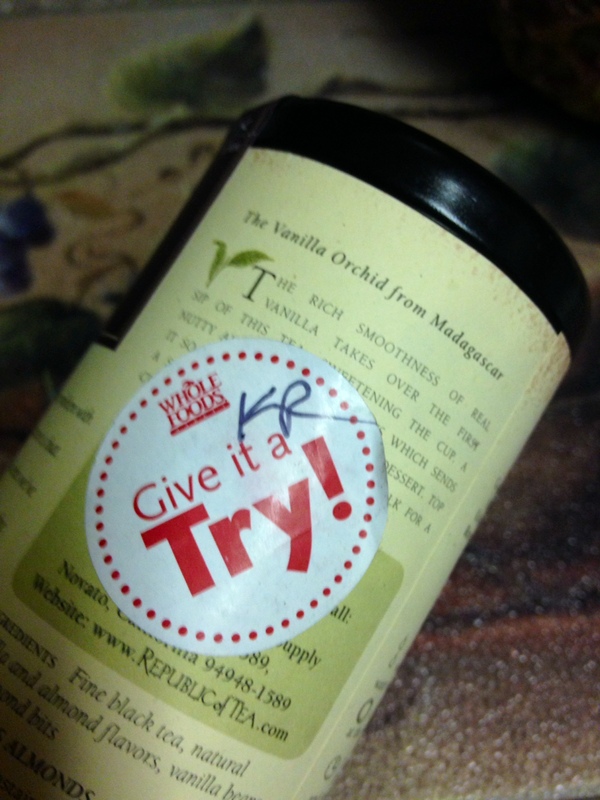 Just to try! I was so excited, by the time I finished shopping, I went back to my new favorite tea person and asked if I could take his picture because I wanted to write up a blog post on his fine example of what it means to provide excellent customer service. He was very happy that I was pleased. So pleased that I made everyone at the checkout know about the great customer service as well. Unfortunately, he wasn’t sure if me taking pictures of employees would be allowed so this post will have to be enough! Apparently, I’m not the only customer this employee aims to please. I ran into another customer, a man, who said the same employee emails him when his special items are restocked in the store! 1. Friendly and helpful staff. People know when employees want to be there and when they don’t. You don’t have to tell a good employee to help a customer. They are happy to be of service. 2. Knowledgeable. They have enough knowledge and experience to answer your questions. They know what they are talking about. 3. They care enough to remember you if they see you again. Depending on type of service, this might be a challenge. It’s exceptional when you run into this. 4. Personalized service. Great customer service caters to the needs of the customers and also helps expand horizons to give opportunities to try new things. 5. In the food industry, try before you buy is ALWAYS a good deal! Now it’s your turn! Share your personal stories where you experienced excellent customer service! Visit the official website of Whole Foods Market to locate a store near you! Oprah and Whole Foods co-founder, John Mackey An interview on conscious capitalism. Brilliantly written article. It’s very rare we see such committed and passionate customer service reps these days. But when we do, it makes our day. These people make shopping, searching or whatever it is we might be doing, a breeze. But these are also the very same people whom those organizations fail to notice. Companies that do notice should try to include this high standards of customer service in their company culture and that would make the difference. Thanks for sharing, Samantha Hall. Thank you so much! Yes, good customer service seems to be very rare these days. This is why I was so taken aback by such attention to detail, his memory of our prior visit and basically, going out of his way to do something I didn’t expect him or anyone at the store to do! Will I be spreading the word about the great service at Whole Foods in my local area? Absolutely! Great service can’t be ignored and news can travel fast when customers have great experiences. I actually had two awesome customer service experiences this morning too and not only did it make me feel great about the companies, but also made my day. My morning had some more sparkle and shine that lasted for hours. Hi Alli! Thanks for stopping by my friend! You are so right. Great customer service isn’t something that should be as rare as finding buried treasure somewhere, and yet, it’s THAT precious and valuable for all companies to demonstrate! You’d think it would be more common. Or perhaps…we, the consumer, are partly to blame for tolerating mediocre customer service! Now there’s a thought..
We need to raise the bar. And perhaps one way we can do it is by rewarding excellent customer service whenever and wherever we experience it. We can make sure we do our part as consumers to let companies and people know what they are doing right by delivering feedback. Would LOVE to get some specifics on your two awesome customer service experiences you mentioned! Care to share any highlights on each of them? What made each experience stand out the most to you? And that’s one of the positive outcomes to excellent customer service, isn’t it? It has the power to make our day! It can totally change our mood! And the free tea? LOVE IT! Tastes like a dessert tea! The beauty is that he didn’t just help a customer. He created a relationship and that is worth so much more. Nice to read on a Friday morning. Very well said! Creating a relationship is the most important component in any business. The power is not in meaningless transactions. It’s in the relationship. Nice to remind ourselves that such white hearted people exists in this life. They guy is so brilliant in customer service but I’m afraid we forgot to notice our brilliant the store management is! To me this is an act of empowerment from the store leaders which by the reps can use to delight customers! You bring up a very important point Khalid. If the company wouldn’t have empowered the employee to do what he did, I wouldn’t have experienced what I did. Perhaps I may have received friendly service yet the employee would have been limited in his ability to allow me to try a product without having to ask someone for permission. Well done, Samantha, in highlighting what superb customer service looks like. Those moments of service make a big difference. I think sometimes about why I stop in the mornings at this particular Starbucks. I am convinced I do it because of Stella. She is always friendly and always remembers the names of people who come through. I honestly don’t know how she does it, but she does. And I keep coming. The human connection is why I go, not necessarily for the coffee. Thanks for taking the time to drop in and add your customer service story Jon. I appreciate it! Human connection is probably (in my opinion) the most important reason why we do anything. Yes, we still have our survival needs and we can certainly get out of balance and confuse wants with needs etc. Yet we still have a fundamental inherent need to connect with each other. Even introverts still want that feeling of connection even if they do enjoy a great deal of time alone. Connection is what makes us human. Connection is necessary for our survival. And it’s just plain good business!